Could this be the future of Space Travel? Here is a video I found on this subject. Hope you like it. Man this is another reason why I get a bit depressed about future space travel. I really like the aesthetically pleasing ships of science fiction. The long, bulbous, asymmetrical ships were due for look a bit cluttered. But I guess the Laws of Physics don't care about aesthetics. At first we had the clunky T-model as an excuse for an automobile, but we gradually evolved into the cars we see today, thanks to the evolution of technological breakthroughs over the years. The same will apply to space transportation. I don't know, I think spaceships of today have a kind of spindly, spidery beauty about them. To me there's something captivating about how the function creates the aesthetics. In the further future, when spaceships are refined down to sleek, gunner-gray rectangles, people will look back upon our designs as people today look back upon wooden frigates of colonial days. The reason our ships today look so threadbare is because it's expensive to get material into space, so they have to refine the ship down to its guts. If we wrapped our space machines up in metallic, jet-shaped hulls with lots of fins and wings and stuff, we wouldn't get anything done. 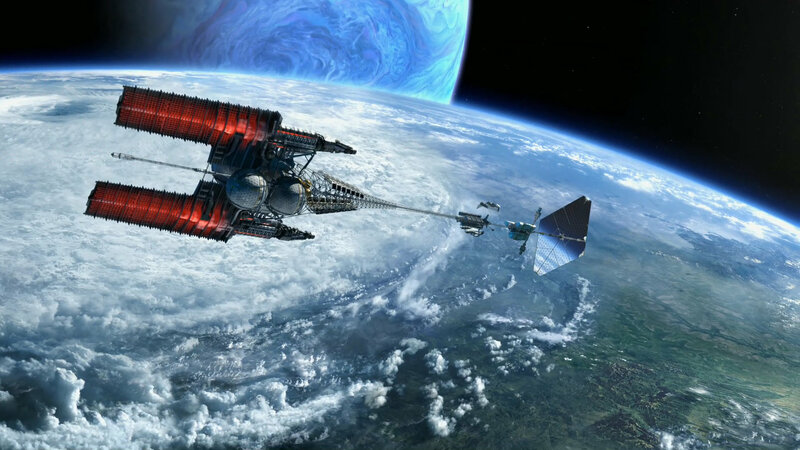 Maybe when we get some space elevators we can actually start making orbital refineries and factories, which would eliminate the need for sending big, clunky machines into orbit from the ground. Then we can start caring about aesthetics. Edited by EVanimations, 28 July 2012 - 11:31 PM. The Skylon spaceplane, if it does work out, is next in the evolution of aesthetics. I do agree in a way with EVanimations. One of my favorite spaceships from fiction is the Venture Star from Avatar, and that has a much more modern design to it. But really, it's just a matter of taste, and though it seems unrealistic now, Raklian is right that once things get cheap enough, aesthetics will come in towards the end, just like with everything else. I forgot about that thing, but I remember really liking the way it looked when I saw the movie. Also I just thought about designing a spaceship made out of classical greek architecture. Like, with corinthian columns and abacus moldings and stuff. Beautiful. I imagine building something like that would only become possible after the space elevators, though. Then things could get really showy. Edited by EVanimations, 29 July 2012 - 01:44 AM. I know you guys probably don't care but I just sketched up this sweet-looking beast in about 15 minutes. The greeks would be proud. Maybe once we get past being able to cheaply and easily design spacecraft while giving full regard to aesthetics, I can see this becoming something of a flagship for humanity. I personaly like the video. It very reminds me of a game I play called X3 Terran conflict. Good game but it makes Eve Online's learning curve look easy. I hate to break it to you guys, but I doubt the aesthetics will matter much at all for these future, awesome spaceships. Sure they'd look awesome, I completely agree with that. But really, would that be worth the exta time, to make it look pretty? If this ship would launch and you're just someone who wants to watch it take off, you'd see the ship. But then, the people inside the ship won't see it again until,they land. And by then, they won't be interested in their ship's design. I strive to be an apple amongst oranges. Well you don't see the outside of your car when you drive, but it probably looks better than a Model T. The design won't be good looking until it is cheap enough, and that will be a long way off. Cosmetics always come after functionality. Cosmetics always come after functionality. I think it's a well established fact that flames on the side of your space craft makes it go faster. Functional and cooler. Speaking of cosmetics, why do we deorbit space stations? Can't we save them for nostalgia later? The first space station ever built is burned and destroyed after being dropped from orbit into the ocean. The same fate is waiting for the ISS, maybe we could put them into a higher orbit until we can do something with them later. Edited by SG-1, 15 August 2012 - 05:49 AM. Wow, this looks really good, looks a bit around 2040-50 tech. Speaking of cosmetics, why do we deorbit space stations? Can't we save them for nostalgia later? The first space station ever built is burned and destroyed after being dropped from orbit into the ocean. The same fate is waiting for the ISS, maybe we could put them into a higher orbit until we can do something with them later. I think the main worry is space junk. The more defunct space stations we leave up there, the higher the likelihood of collision or gradual breakdown over time. And this would be more than satellites. The ISS alone could do huge damage to other things in orbit if it was eventually battered down into debris by various impacts. We would be at serious risk of triggering the Kessler Syndrom.